"You wanna do what??? ", I exclaimed when Choobee suggested our dining destination. Taiwan Taipei Original Pot??? Was this some new competitor for BC bud? Hey, I'm open to some crazy food adventures, but this was going too far! Alas, it wasn't what I thought it was. 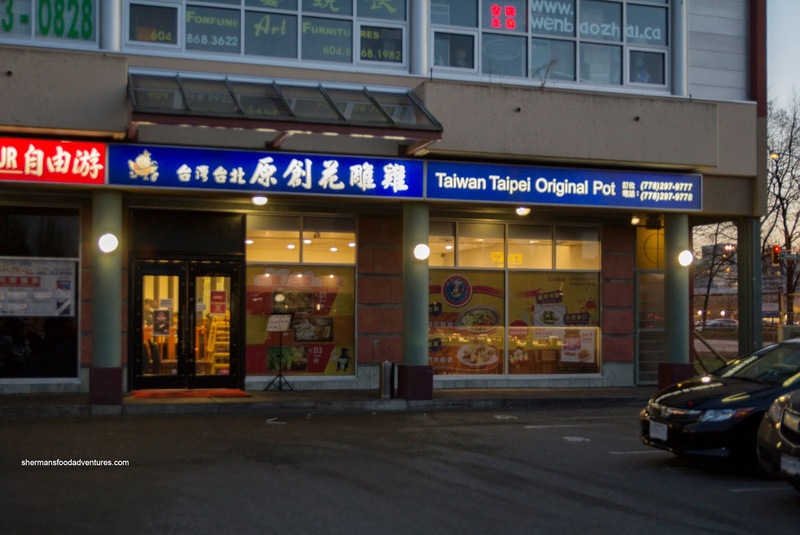 In actuality, it is a "hot pot" restaurant that does things much differently than all of the other Asian hot pot joints in town. You see, the meal goes step-by-step (oooh baby, gonna get to you girl...). No really, there are 3 steps or courses in the meal. Step 1, you can have lots of fun (sorry for the lame joke - fun = noodles in Chinese, get it???). Anyways, step 1 involves ordering one of their available hot pots. In this case, we got the Boneless Hua Diao Chicken hot pot. 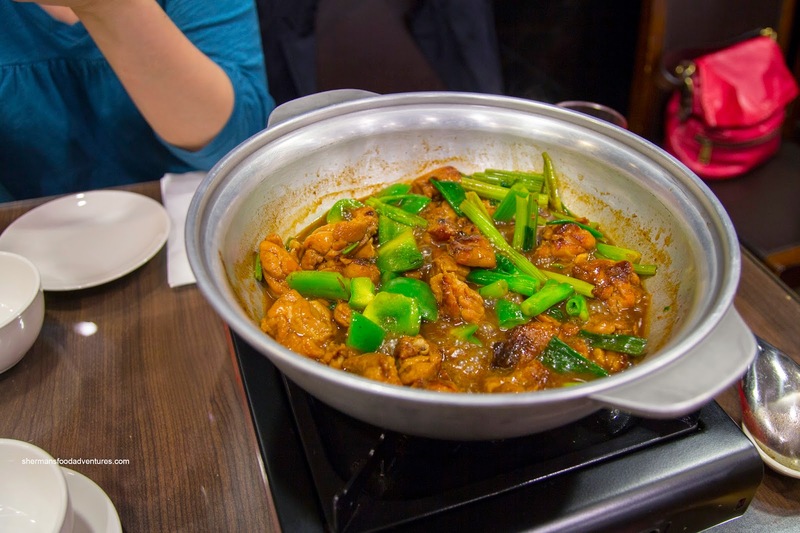 As the name suggests, the tender morsels of chicken were cooked in a sauce that featured hau diao rice wine in addition to celery, green peppers and green onions. This was quite sweet and savoury with a fragrant finish. The greens meshed with these flavours as they wilted in the bubbling sauce. We were halfway through the dish when they removed the ingredients and placed them on a separate plate. Step 2, they added both the Wide Noodles and Enoki (that we had to order as a side) to the sauce and cooked it until they were just done. 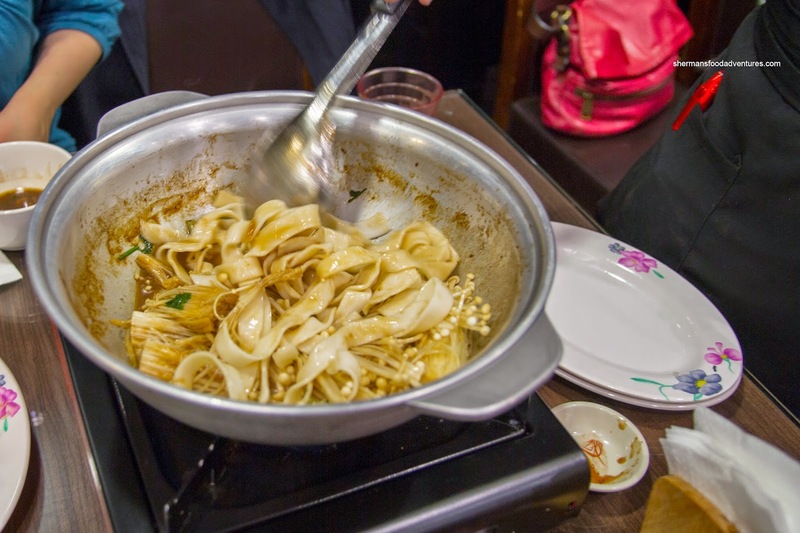 The chewy noodles took on the same flavours as well as the Earthiness of the mushrooms. This was our favourite portion of the meal. 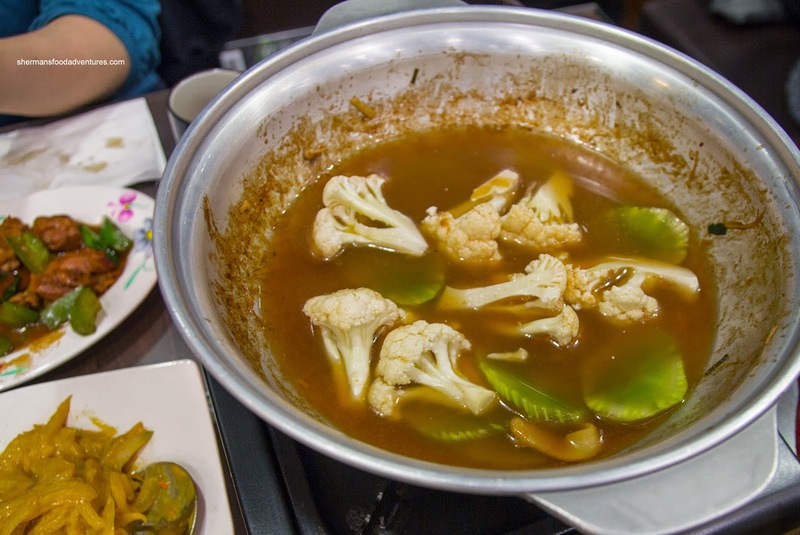 Step 3, they cooked our 2 selected veggies, Cauliflower and Lettuce Stems, in a combination of the remaining sauce and water (to dilute it). The doneness of the veggies were completely up to us and we decided to keep them crunchy. Since the sauce was diluted, the flavours were definitely muted. It was more about textures and something healthier to eat. 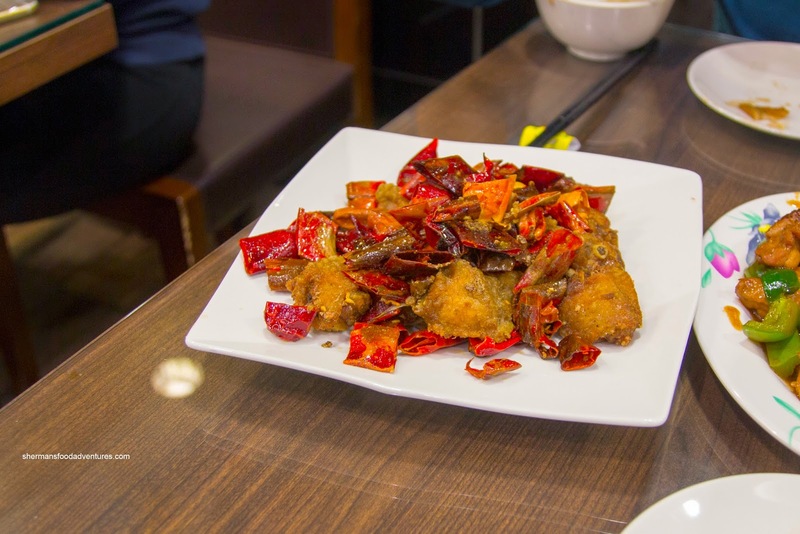 To keep things interesting, we also got a couple of dishes on the side including the Chili Wings stir-fried with Szechuan spices and chilis. This was pretty good with crispy well-rendered skin while juicy inside. Despite its appearance, the dish was not spicy. Rather, it was aromatic with the smokiness from the unopened peppers and plenty flavourful from the dry spice powder. 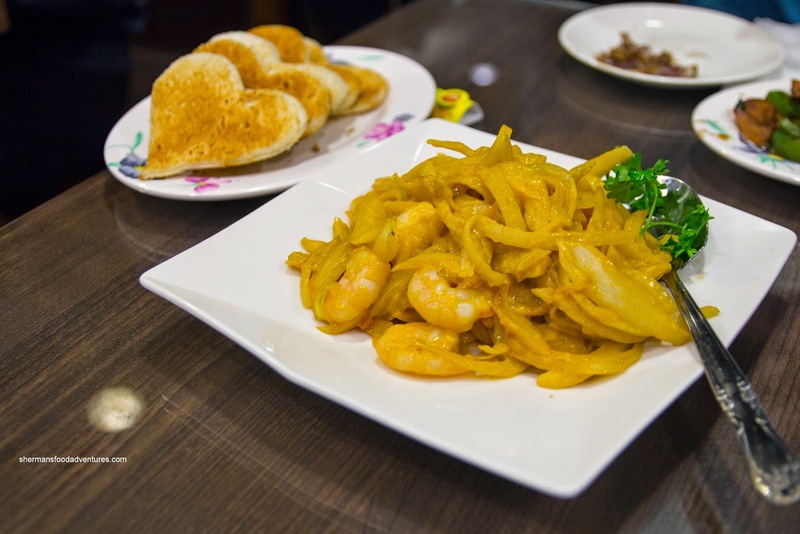 Lastly, we had the Prawn & Egg Yolk Stir-Fry with onion slices and toast served on the side. We weren't that impressed with this dish as it was mostly onion with very few prawns. As for the prawns, they were meaty with a slight snap. We found the sauce to be very mild and creamy, yet ultimately overshadowed by the pungency of the ample onions. Despite ordering more than enough food, we were able to finish practically everything. Considering the bill went North of $80.00, we weren't sure if it was necessarily a cost-effective way to eat in Richmond. Yet, it is definitely something different.